How often do you get the chance to experience something you’ll (probably) never see in-person? Not often enough, I say! That’s why the Bishop Museum in Honolulu is featuring a new exhibit called “Journeys: Heritge of the Northwestern Hawaiian Islands.” The exhibit focuses on the history, science, and culture of the Papahanaumokuakea Marine National Monument, a place so remote, pristine, and fantastic that most of us will never get to see it. But, you may be wondering: What is the Papahuanaumokuakea Marine National Monument — and why should I care what it is?! Well, the Hawaiian island chain actually extends another thousand miles to the northwest, to a chain of small islands, atolls and barely submerged reefs. This part of the archipelago provides a vital connection to the cultural and natural history of the main Hawaiian Islands. In fact, according to the Bishop Museum, Papahanaumokuakea is a model for regeneration and revitalization of unique natural and cultural landscapes. 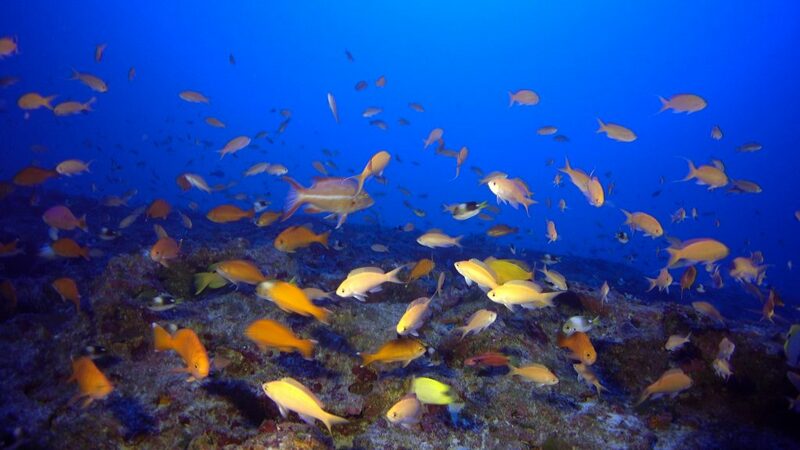 About 24 percent of reef fish are endemic; at Rapa Nui (Easter Island), the rate is about 23 percent. In Papahanaumokuakea, as reported in a study published last month, researchers discovered that “some reefs at 300-foot depths of Kure Atoll have 100 percent endemism. While no longer inhabited by humans, the Northwestern Hawaiian Islands are densely populated by wildlife, including seabirds, turtles, endangered Hawaiian monk seals and species of fish endemic to Hawaii, meaning they exist only here, Richard Pyle, a zoologist and associate researcher at the museum, told the Honolulu Star Advertiser. An original exhibit which will highlight kii (carved figures) from Mokumanamana-six from Bishop Museum’s Ethnology collection and two on-loan from the Peabody Essex Museum, and the Metropolitan Museum of Art. Memorabilia from the “Golden Age of Air Travel”, when Midway was a key stop on transpacific routes. The story of the Battle of Midway, the turning point in the Pacific Theater in World War 2. According to the Bishop Museum, Papahanaumokuakea is a model for regeneration and revitalization of unique natural and cultural landscapes. Dozens of rarely seen objects from our Cultural and Natural History collections. Hard to believe the islands of Hawaii don’t end with Kauai and the Big Island — in fact, they extend thousands of miles to the northwest! So, if you need a break from surfing, Sea Life Park, or stand-up paddling (or maybe you have a puka of time to fill before your luau), head to the Bishop Museum and soak-up some history and culture!